I have taken a few days to consider my views since the official confirmation from the club that the Everton badge will undertake its biggest evolution since its original conception in 1938. I have watched the video’s, listened to the arguments for and against change and studied the design brief to fully understand the position we find ourselves in today. And although some of the rational put forward in the clubs propaganda campaign, may ring true, the wiping away of 75 years of tradition in one swoop sits uncomfortably with this Evertonian. The clubs creative department approached the redesign by breaking down the different elements of the club badge, deciding bit by bit, whether to modernise, maintain or remove altogether. In this article, I will do the same, looking at the elements of the new and old crest, offering my view as a humble match going Evertonian, following my club up and down the country, supporting the Blues, wherever and however they play. Prince Rupert’s Tower, situated on Everton Brow has featured proudly as the focal point of the Everton crest since it’s incorporation into Theo Kelly’s design in 1938. The tower has taken on many different iterations, during the following 75 years, and the clubs creative department have correctly pointed out that over time, the tower has become misrepresented, with the badge on the current shirt depicting a tower that bares little resemblance to reality. The new design brings a simpler, cleaner and modern digital approach, and in truth more accurately depicts Prince Rupert’s Tower. Many have argued that the tower is to cartoon like, and not befitting the heritage of a club such as Everton F.C. I sincerely believe that the tower is one element of the new crest that the club have got right, bringing the club forward into the HD age, whilst respecting the clubs 135 years of history and tradition. The shield has remained largely untouched, since the club first introduced a crest in 1920. Prior to the development of the clubs first official crest in 1938, Everton had incorporated a badge on their shirts, as far back as 1920. An intricate shield, enclosing the famous EFC, provided the template for the Everton crest from that day forth. Although at times the shield disappeared from the club shirt, it remained an integral part of the clubs official crest and thankfully it has remained the outline of the clubs current design. In recent years, many clubs have chosen to abandon their more complex shield designs in favour of a more simple approach, however on this aspect, Everton have remained true to its heritage. The laurels depict success and as one of England’s most successful football clubs, have featured prominently on the Everton badge since 1938. A slightly controversial omission from the new design many Evertonian’s could and probably would accept the laurels disappearing in a more gentle evolution of the club crest. 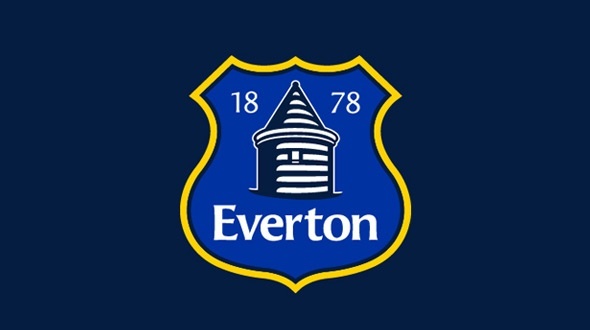 Introduced as recently as they year 2000, the year of the club’s formation has been a welcomed addition to the clubs badge, proudly depicting the 135 years of Everton’s rich and successful history. It is no surprise to me that the club have chosen to retain this element of the crest, with many institutions, both in sport and the wider world, choosing to highlight their iconic and honorable past. In 1938, Theo Kelly thought it important to incorporate the clubs full name into crest, with Everton Football Club Co. Ltd. semi-circling the top of the badge. From that moment through to the end of the 1980’s, either Everton or EFC featured prominently in the badge. Strangely, in 1991, the evolution of the club’s badge failed to include the name of the institution is proudly depicted and with the game taking on such global prominence in the late 90’s, it was with no great surprise that the club added the club’s name to the crest in the year 2000. Concerned that it is often left out of many reproductions of the badge, the club have taken the step to include Everton within the traditional shield for the first time. For the majority of Evertonians, nothing optimises Everton more than its famous Latin motto. Nil Satis Nisi Optimum, “nothing but the best is good enough”. A simple statement that encapsulates what playing for and supporting Everton is all about. For me, it represents striving for the best. Accepting that the club will not always be the top dogs, it shouldn’t however, prevent the club and everyone associated with it striving for glory, striving to be the best. Its omission from the crest, is for me, the most controversial aspect of the redesign. The club have gone to some lengths to explain that it will remain the focal point of the club, but if that is truly the case, then why has it been removed from the badge that represents the club across the world. Everton legend Tim Cahill, has even taken to his Twitter feed to express his shock and disappointment at the loss of the clubs motto from the new logo. The disappointment amongst fans is plainly evident, no more so than the campaign to have the old badge re-instated, which at the time of writing had almost 20,000 names in support. It will be difficult for the club to back down, and the rational for the change makes sound business sense. But Everton are far more than just a business, and for me, the loss of identity and tradition, the removal of the clubs motto that stands for so much, is one step too far. In time, much does change, and evolution is inevitable, but the closing message from me is, bring back Nil Satis Nisi Optimum and all is forgiven. Previous Post Is Pereira the new Manager?